The California Gold Rush….. Eureka! Discovery of gold in 1848 carried California’s name around the globe. Men came from the East, from England, Germany, Chile, China, and all around the world. 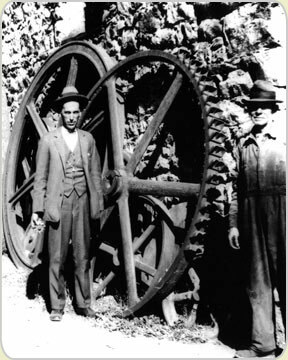 By the mid-1850s, an estimated 120,000 miners were at work in California. For the most part, prospectors found little romance in the Gold Rush; mining was hard, dirty work. Prices were high, living conditions bad. Few miners struck it rich and most of the profits went to merchants and suppliers. By 1873, the number of California miners had dwindled to 30,000. Mining was becoming more of a business, less of an adventure. Wealthy mine owners built large hardrock and hydraulic mines that employed hundreds of men. The rich underground mines of Grass Valley made it the richest mining community in California. Even during the Depression of the 1930s, Grass Valley thrived because of its mining-based economy. The business districts and Victorian neighborhoods of Grass Valley and Nevada City grew from this early mining heritage, and these historical treasures are carefully protected today.